This is what orthomolecular therapist Marco van de Pol from the town Laren in The Netherlands tells us. 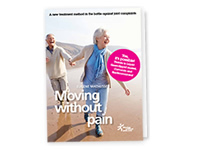 He runs the vitality clinic Health Plus and discusses the natural food supplements that can inhibit inflammations that occur in most cases of arthritis. He has seen remarkable effects with the green-lipped mussel from New Zealand, curcumine and black currant leaf, especially when these are combined in a liquid formulation. In the video he explains the rationale for such a combination. There are more video’s available with orthopedic surgeon Jan Ide de Jong or pharmacist Han Siem on various specific subject that may be interest to you. How to select the best quality curcumin? Do you have any additional questions? Then it may be useful that you download our information booklet. In addition you can always contact us in case that you may have personal questions.